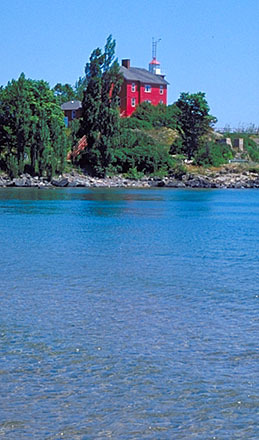 The town of Marquette lies about midway across Michigan's upper peninsula, on the south shore of Lake Superior. 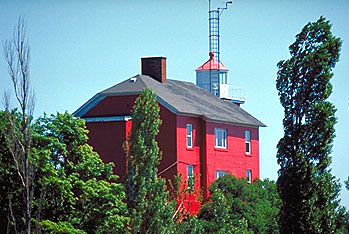 This red brick structure was built in 1866 and fitted with a Fourth Order Fresnel lens. 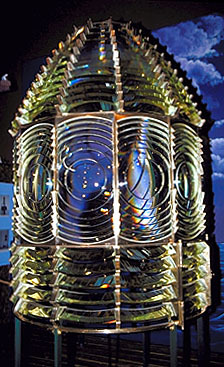 The current optic is a DCB24 Beacon. The light is still an active aid to navigation. This light is guarded very closely by the Coast Guard, making it difficult to get a close-up view. 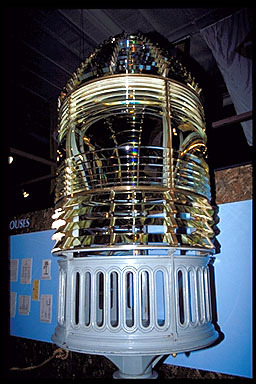 However, the Marquette Maritime Museum is near the light, and features two fine examples of fresnel lens. The original massive two-ton Second Order lens from Stannard Rock is on display as well as a very rare Three and One-Half Order lens from Big Bay light. The museum is open daily from May 1st through October (906-226-2006). I was not able to get over to Big Bay, which is just west of Marquette, but that light has been converted into a bed and breakfast with lodging in the keeper's house.